Chris Buccini, City Council President Hanifa Shabazz, and Council Member At-Large Ciro Adams react to the Mid-town Garage Grand Opening. WILMINGTON, DE– Accompanied by Mayor Michael S. Purzycki, Wilmington-based developer, The Buccini/Pollin Group, Inc. (BPG) and BPGS Construction celebrated the grand opening of Mid-town Park Garage, 511 parking spaces in the most centrally located spot downtown at 840 N. Orange Street Wilmington, DE. 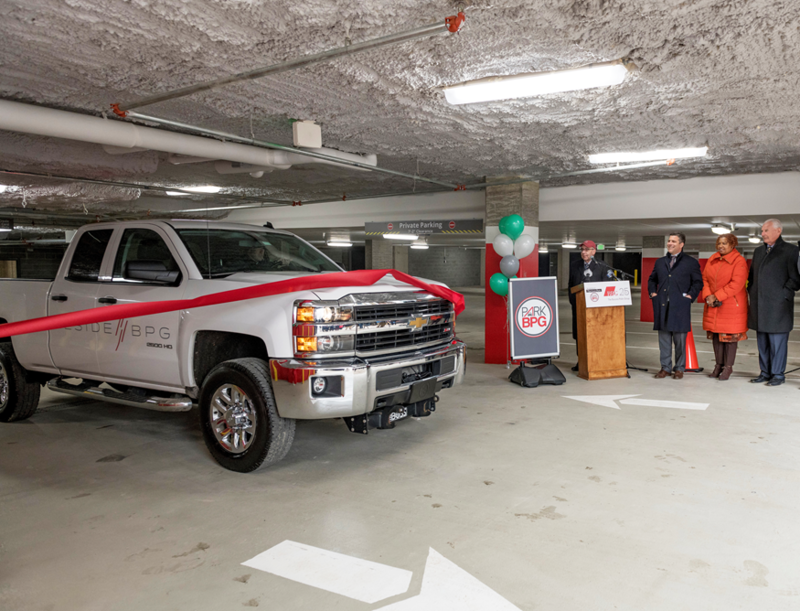 Mid-town Park Garage marks a major milestone in redevelopment downtown as it is the first subterranean parking garage in the City of Wilmington. It also restores much needed public parking to the downtown, which has been lacking since the former Mid-Town Parking Garage was condemned. The garage will not only support the local employers and apartment communities, but also the retailers and restaurants on Market Street. The new Chelsea Plaza walkway, which will connect Market Street and Shipley Street in an expansive outdoor patio, will allow visitors and residents easy access to Market Street and other Downtown destinations from the Mid-town Park Garage. $1 parking validation will be available for anyone who visits a downtown restaurant or entertainment venue. The occasion also marked the official launch of pre-leasing for The Residences at Mid-town Park, a ResideBPG community consisting of 200 apartments in 2 buildings and 12,000sf of retail space. 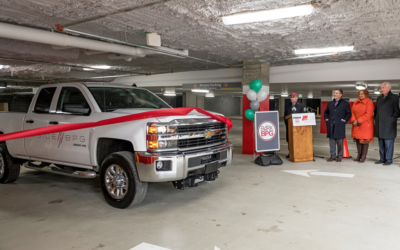 Following the unique ribbon cutting ceremony, which featured a ResideBPG vehicle driving through the ribbon at the entrance of the garage, guests enjoyed hard-hat tours of the model apartments. Scheduled to open in the Summer of 2018, the Residences at Mid-town Park will feature cutting edge amenities the Delaware market has not yet seen including a demonstration kitchen and a dog washing station. An elevated courtyard will include a 33’ x 30’ swimming pool and barbecue area. The Residences at Mid-town Park will include studios, one and two-bedroom apartments with stainless-steel appliances, quartz counter tops and high-end finish details throughout. 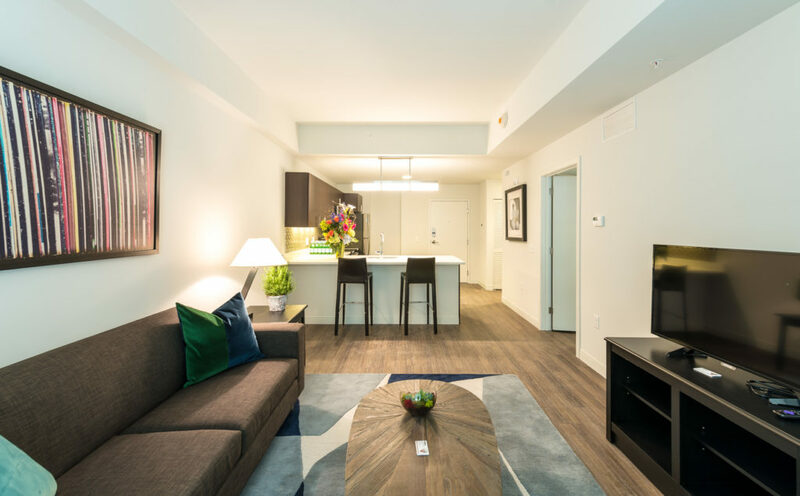 Immerse yourself in the vibrant downtown lifestyle – The Residences at Mid-town Park is where the energy of the city and the conveniences of downtown accessibility collide, steps away from nightlife, restaurants and shops. Offering endless amenities that create opportunities for fun and social engagement including a fitness center, screening room and resident lounge. The Residences at Mid-town Park is not simply a community, it is an urban oasis. * The two months of complimentary parking will be deducted from each month’s apartment rent charges. Exclusions apply, see leasing specialist for details. Free parking eligibility is only available with rental of apartment. For more information on leasing an apartment home or taking a tour please call 302.257.5727.